December 23, 2016 • Great Depression and World War II, Hide Featured Image, Middlebury, Popular Culture, Waterbury, Who Knew? 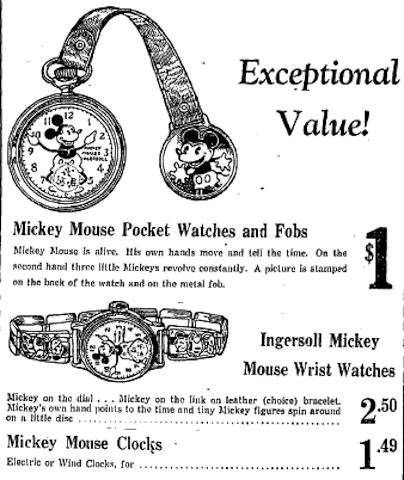 …that the Ingersoll Waterbury Company (now Timex) was saved from bankruptcy during the Great Depression, in part, by the introduction of the Mickey Mouse watch. Connecticut’s Naugatuck Valley once manufactured millions of clocks and watches, and the Waterbury Clock Company was one of its biggest producers, manufacturing over 20,000 clocks per day by the end of the 19th century. Building on the history of Connecticut’s clock making innovations—from the introduction of mass-produced parts and the design of the first shelf clock, to the introduction of brass movements—the Waterbury Clock Company’s initial success stemmed from their ability to manufacture clock movements small enough to fit in a pocket. Later, in 1892, they introduced a piece known as the Jumbo pocket watch, named for P. T. Barnum’s elephant. But their best-selling item was the “Yankee” pocket watch produced for Robert H. Ingersoll & Bro. which sold for a dollar and appealed to the masses. Consequently, by 1915, Waterbury Clock was the largest clock maker in the United States. With the advent of World War I, Waterbury Clock continued to place itself at the forefront of innovation when they modified one of Ingersoll’s Ladies’ Midget pocket watches for use by the military. The company added a canvas strap and luminescent numbers that allowed soldiers to easily read the time, giving rise to a new form of timepiece—the wristwatch. Civilians soon wanted them too and the wristwatch became part of the company’s regular product line. After the war ended, Ingersoll entered bankruptcy protection. The Waterbury Clock Company purchased Ingersoll and became Ingersoll Waterbury Clock. But by 1932 the Great Depression had taken its toll on the new company and it struggled to remain solvent. Walt Disney Studios was also struggling during this time and looking for new ways to profit off licensing their cartoon character Mickey Mouse. 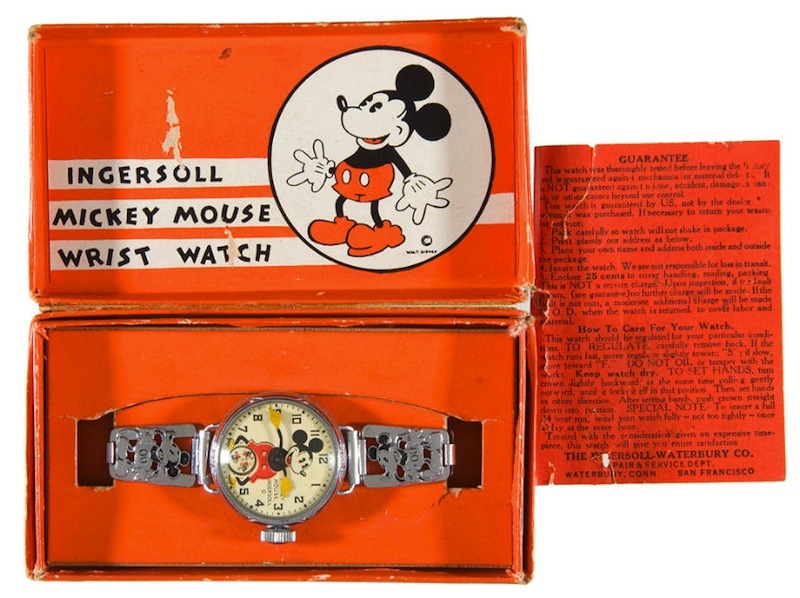 A partnership between Disney and Ingersoll Waterbury then produced one of the most iconic watches in American history. Waterbury Clock Company submitted a patent application on May 22, 1933, for a “Time Instrument . 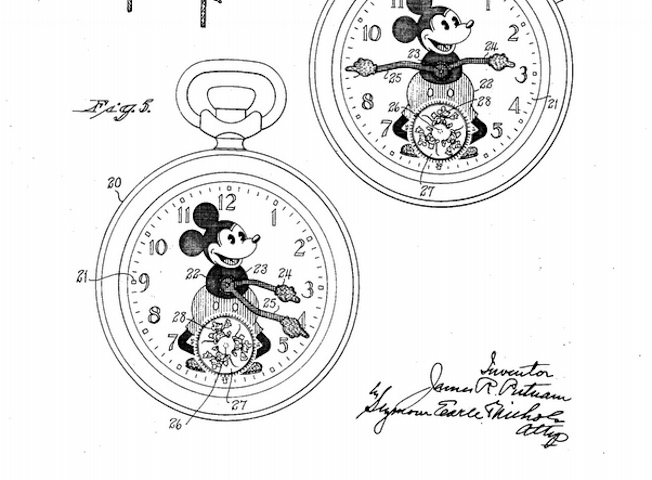 . . in which a picture is associated with the dial.” The patent drawing included an image of Mickey illustrated with moveable arms. The patent was granted to Waterbury Clock Company in 1935 but the Mickey Mouse line had already been introduced to the public back in June of 1933. The watch rolled off a miniature assembly line at the Chicago World’s Fair and on the first day of sales at Macy’s the store sold 11,000 of these highly sought-after watches. The 1933 Sears Christmas Book also offered the watch and within a year and a half the Ingersoll Waterbury Company had sold over two million watches. In 1935 the Hartford Courant reported that Waterbury Clock had added an additional three thousand employees to their staff and the paper gave Mickey Mouse most (if not all) of the credit for this growth. Eventually Waterbury Clock became Timex, and today its corporate headquarters are located in Middlebury, Connecticut. Putnam, James R. Patent Number 1,989,881 - Time Instrument. 1,989,881. Waterbury, CT, issued February 5, 1935. Link. “Mickey, Industrialist.” Hartford Courant. January 28, 1935. Gifford, Emily. “Takes A Licking And Keeps On Ticking.” Connecticut Explored, Winter 2015. Link. “Waterbury Firm Busy, Pay Rises.” Hartford Courant. June 9, 1933.